Send lilies to express your thoughts. The FTD®Spirited Grace® Lily Bouquet. This bouquet offers sweet serenity with every fragrant bloom. 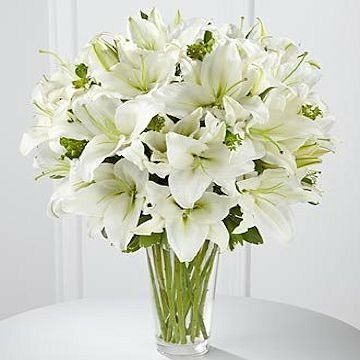 Bright white Oriental lilies create a simple, yet sophisticated bouquet, arranged in a sleek clear glass vase sending your wish for happiness and tranquility. Large bouquet is approximately 21"H x 14"W.
Deluxe bouquet is approximately 22"H x 16"W.
Premium bouquet is approximately 24"H x 18"W.